Nancy O’Hare is the author of Dust in My Pack. She has travelled to over seventy countries and lived across five continents. O'Hare coupled a near twenty-year career in finance with her passion for diverse cultures, which propelled her to seek out unique experiences. O’Hare’s husband shares her passion to visit distant lands and captures remote scenes in his photography. Together, they have transitioned from a corporate career to pursue their creative pursuits and explore our planet, one country at a time. O’Hare captures moments from multi-month journeys to off-the-beaten path locations in her writing. Her love for nature and intriguing cultures is revealed in stories across all seven continents. Inspire your inner traveller with her refreshing perspective on little-known destinations. O'Hare's travel writing structures stories into themes, such as trekking and ancient sites. Dust in My Pack is available as an ebook and paperback at most online bookstores. A second book - Searching for Unique - is coming in 2018. 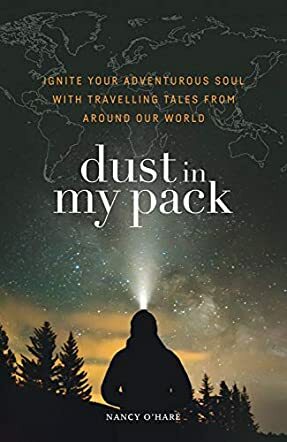 Nancy O’Hare’s Dust in My Pack is part of a new generation of travel books. This book, and others like it, is an adventure log, a testament to a life well lived. The book is divided into subject chapters for ease of use: Boat Trips, Multi-day Treks, Getaway Adventures, Ancient Cities, Animal Encounters and Unforgettable Accommodations, to name a few. Each chapter is then sub-divided into a particular destination, with a synopsis followed by the adventure. It’s a very clever way of organizing this book. I particularly loved the visually descriptive manner in which O’Hare takes us on these adventures. I felt I was able to walk along with her as she journeyed. Dust in My Pack is a beautifully imagined and implemented work. Nancy O’Hare’s voice and attention to detail are just what I want in a travel log. The cover art is wistful and beckons the inner adventurer. O'Hare has chosen locations that are not particularly "touristy" so the flavor of the culture and surroundings is all the more authentic for not having been adjusted to suit the traveler. That is not to say that the locations were not welcoming of travelers, just that travelers have not corrupted the experience to be had. I doubt that I will ever get the opportunity to travel to Cambodia to take a boat ride to Stung Proat, surrounded by grey monkeys and great black and white birds with massive wingspans; nor will I probably ever snow shoe in Switzerland, but O’Hare did, and she was kind enough to take me along. Dust in My Pack is a treasure for any person who lives with unrequited wanderlust. I hope O’Hare continues her adventures and continues taking me along, because there are so many more places I want to go.